Mekuria Amare, a health officer in the North Gondar Zone of Ethiopia, is currently completing his clinical training at Gondar University to become a medical doctor. 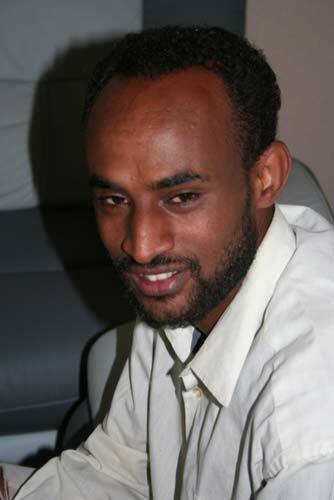 Mekuria initially received training as a health officer, providing him the opportunity to provide general health care to a rural population. In 2007, he was trained by The Carter Center to provide trichiasis surgery at his health post in the remote district of Telemt. Before returning to medical school in 2008, he had performed 260 surgeries at his health post, serving his community and surrounding villages. "The infrastructure in Telemt is amazingly difficult," he reported. "There are no roads, no services. It's very difficult for the population to seek medical care and even less likely for outreach services to find them." Despite the difficult environment, Mekuria continues to conduct trichiasis surgeries, even though he is no longer stationed in the district. During his school vacations, he travels to Adi Arkay, the nearest city. From there, he walks two days to reach Telemt. In January 2009, he conducted a 15-day campaign with a fellow student, together operating on more than 500 people. "There were a lot of cases," Mekuria said. "We were the first to offer them surgery." Because the area is so remote, he worked with local health extension workers to ensure patients in the community were informed in advance. "The health extension workers were my right hand," he explained. "They were very effective at educating the community." Mekuria plans to conduct future campaigns in the Debark district of North Gondar Zone. Even though he does not work there routinely, he has made arrangements with the district health authorities. He also has encouraged his friends to train as TT surgeons. When asked why he continues to participate in the trachoma control program as a medical student, he replied: "We have a talent to give this surgery, and we have to help by any means. It is our mission." Although now a medical student, Mekuria Amare continues to provide trichiasis surgery to patients in isolated communities in Ethiopia.